The term Britannia has been used in the Western world for more than two centuries now, referring to both the British Isles as a region under Roman control and the people of Britain themselves. 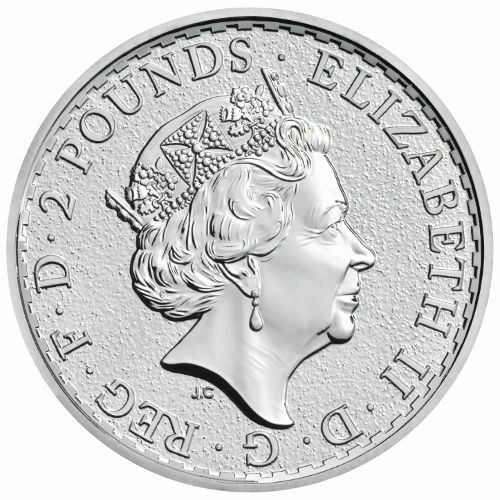 Right now, the 2016 1 oz Colorized Silver British Britannia Coin brings that image to life in a manner never before seen, and it’s available on Silver.com. Arrives in a protective plastic capsule. Mintage limited to 5,000 colorized coins! Colorized by private mint Emporium Hamburg. Bears a face value of £2 (GBP) backed by the government of Britain. Reverse includes a colorized image of Britannia. During the Roman conquest and occupation of the modern-day British Isles, the term Britannia was first coined to refer to the region as a Roman province. Over time, the people of Britain themselves became referred to as residents of Britannia and even had a deity named after their homeland. As a deity, Britannia was said to guard the British Isles and keep out invading forces, a factor that armies for centuries have had to deal with in trying to cross the English Channel from northern Europe into southern Britain. The first use of Britannia in reference to coinage came in the early 1700s when the United Kingdom first formed. On the reverse of each of these 2016 1 oz Colorized Silver British Britannia Coins you’ll find the image of Britannia with beautiful colorization added to the design. Her figure is cloaked in a white robe, while her Corinthian helm gleams in a beautiful golden hue. Her shield, with which she defends the isles, bears the red, white, and blue of the Union Jack. The obverse of the 2016 1 oz Colorized Silver British Britannia Coins features the all-new effigy of Queen Elizabeth II. This fifth-generation right-profile portrait is from Royal Mint designer Jody Clark, who at 33 years old is the youngest artist ever to create Her Majesty’s image for use on currency. 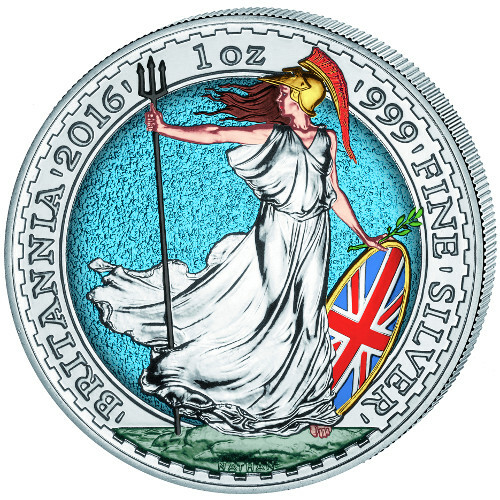 All of these 2016 1 oz Silver Colorized British Britannia Coins are originally struck by the Royal Mint, but Emporium Hamburg has acquired just 5,000 coins to add this unique colorization to for a limited release. Emporium Hamburg is an authorized third-party dealer located in Germany. As a coin with BU condition, these products exhibit no signs of wear and tear, though you may notice minor flaws including breaks in the luster, spotted surfaces, and contact marks. If you have any questions, please don’t hesitate to ask. Silver.com associates are available at 888-989-7223, online using our live chat, and via our email address.